Is there a season that better captures the sweetness of melancholy? As summer winds down, I resist the pull of autumn. Winter will be here soon enough, I think. But come October, there is nothing for it but to give yourself over fully to the delights of the season. It’s a great time of year to be outside. You don’t have to hunt down shade or apply and reapply sunblock to sweaty kids. Just make sure everyone is warmly dressed, and you’re good to go. There’s a lot to like about the fall. Here’s a short list of my favorites. If you have a chance, leave a comment or two and tell me yours. Aside from the romantic possibilities, an aspect of the traditional hayride that is not lost on me, hayrides can be a lot of fun. Our hayrides vary, from the one my parents throw every fall to the two-buck-a-ride hayride at the local apple orchard. When the weather’s a bit chilly, sitting down for a ride can even be chillier. This forces everyone�parents, kids, dog�to all snuggle into the hay next to each other. It’s a great time outside, especially if the ride ends near a bonfire. Linus had it right. There’s a lot to be said for hanging around a pumpkin patch. In the past we’ve taken a tractor ride out to local patches. And my dad grows a decent, yet humble, spread. The goal has always been to find the perfect pumpkins for carving. (With a pile of resulting seeds that we roast to pieces.) This year, however, I am going to try something a bit different. We’re looking for jack-o-lantern gourds, and we’re looking for some pie pumpkins. Having always made pumpkin pie from a can, it will be interesting to taste what you get when you make a from-scratch pie. In our part of the country, the nightly weather report includes a tracking of the changing colors of the trees. It is often thought that the changing of colors is a passive thing�that the bright reds and yellows and oranges are what’s left after the green has gone. Scientists, however, tell us that this isn’t true. 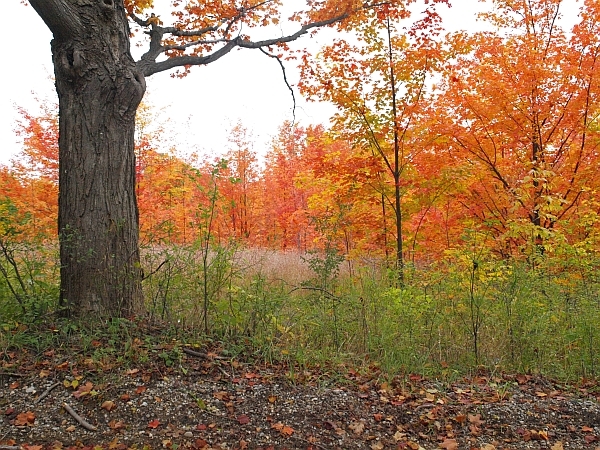 In fact, trees actually expend energy creating the colors that set the forests ablaze in autumn. Why do they do this? No one knows, but we’re certainly appreciative. 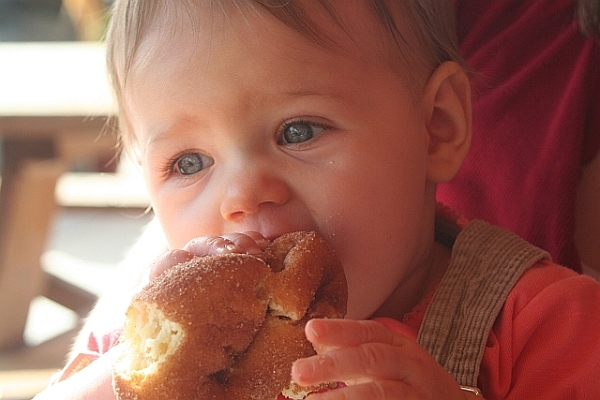 We’ve tried cider doughnuts all over the country. Wherever they harvest apples in autumn, you will find cider mills and cider doughnuts. I will say this, though. The only place to get real cider doughnuts is in Michigan. No other region seems to make them just right. Here you find soft doughnuts with a slight crunch. Dredged in cinnamon and sugar while they’re still warm and served up with a jug of fresh-pressed cider, there’s nothing better. The simple pleasures are always the best, and nothing’s simpler than a pile of leaves. For the past two weeks we’ve been raking up piles, then knocking them down. The smell of musty leaves must be like catnip for our dog who seems to go crazy in these leaf piles, running through at top speed, twisting in mid-stride and rolling to a skidding stop, burying himself in leaves. 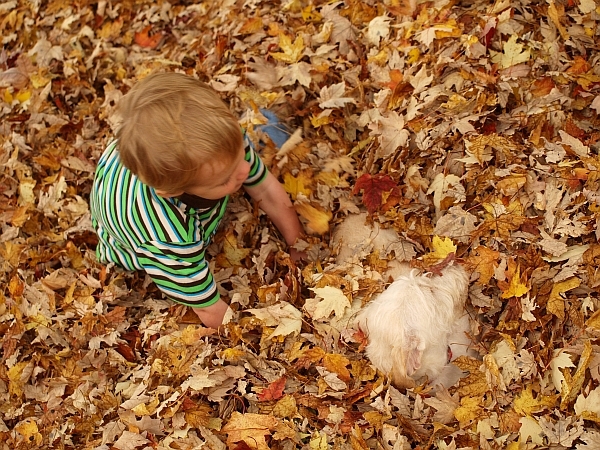 The kids like to bury each other and me.� I like to lay out in the leaves and take short naps.